Starting to feel a tad stressed with less than a week to go before Christmas? Try adding a little JOY into your day! 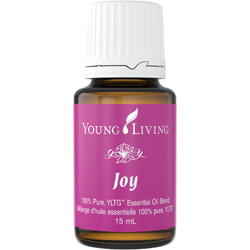 YOUNG LIVING’s Essential Oils has the perfect oil for adding energy and joy to the heart, mind, and soul. It’s uplifting aroma inspires romance and love and may also help bring peace and relaxation to those in need it. It’s ingredients include bergamot, lemon, palmarosa, ylang ylang, mandarin, rose, geranium, jasmine, Roman chamomile, coriander.